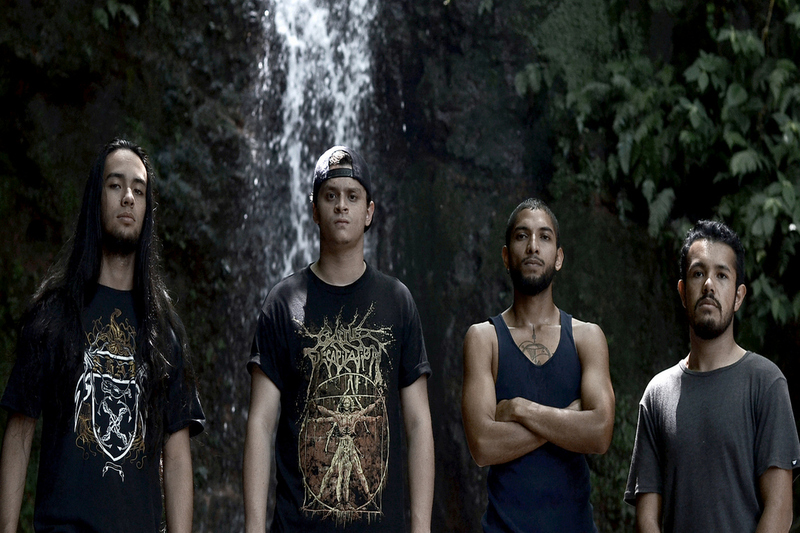 We travel to Costa Rica this week to shine the spotlight on Nostoc for Meet The Band. Aevum is the progressive groove metal band’s first album. Vocalist/guitarist Freddy Lopez, guitarist David Miranda and drummer Emmanuel Calderon introduce us to their band. Chad Bowar: Give us a brief history of Nostoc. David Miranda: It all started the day that Freddy was playing with Leo and Ariel (from the previous Nostoc alignment). We met because we were neighbors, and in a very short period Freddy started looking for an alternative project of thrash metal, and that’s when he met Emma. Emma was then incorporated to the group, and Nostoc was created. A short time later, for personal reasons, Leo abandoned the band and we started looking for a bass player. That’s when Jorge came in. We met with him to jam and we had a lot of chemistry, and since then, almost four years ago, we have been a solid group. Describe the songwriting and recording process for Aevum. David: It has been a very natural process, which I believe is what mostly describes the sound, too. Everybody has different influences and we really try to incorporate all of them, find balance and be able to achieve the final result. Composition is also something that’s not based in one of us, but actually all of us contribute. It goes through filters and reviews as well until we are satisfied with it. David: Our sound is a little aggressive, but also with some delicacy in the technical part, which makes it fresh as well, and complements the modern metal sound. Why did you decide to release the album independently? Freddy Lopez: This was mainly because we didn’t want to delay the process of getting the album out. Not that we wanted to do it quickly or hastily, but finding a label for an emerging Costa Rican band without knowing what were we going to deal with in an international market and any label that would benefit us, was throwing the stone way too far. So we decided to release the album independently so our music and our product could speak for itself, which we believe is already happening. From here on we could keep on doing music with a label that would like to work with us. Freddy: The response to the album has been amazing. The reviews, people’s comments, everything has been kind of subjective and adjusted to each person’s individuality, so it has been as diverse as the music itself. We haven’t really received anything negative so far, which doesn’t mean that there won’t be negative comments, but not so far. There has also been a lot of amazement because of the band being from Costa Rica and comments or reviews from Europe and North America have been like “Wow, Costa Rica can do good stuff, we have to pay attention.” That is part of our goal as well, not to forget where we come from, nor where we’re going. What has been your most memorable Nostoc live show? Freddy: I believe that the most memorable live show was this past Friday (August 4th), when we did the pre-release concert. Being able to actually see the support, the love, and feel all of the efforts was amazing. It was a very powerful show, with great connection between music as the connector, us as the executors of the music and people receiving it, it’s a very energetic communication that has no comparison whatsoever. Freddy: The next concert is on September 16th with Chemicide and Sight of Emptiness, which is one of the bands that has motivated us to look forward when it comes to national music when we started our project with Nostoc. We also have another show with heavier bands: Pseudostratified Epithelium, Corpse Garden and Black Whispers, but we don’t know the date yet. We are also planning to tour. We don’t have anything settled yet, but we’re working on it. Freddy: My beginning in the music was since I was a kid, I used to play toy guitars. The first real guitar I got was in high school, and then I got an electric guitar because of a dream I had with some classmates to have a band. After this I had an actual dream that I had a band, so I told my friend that I dreamt it and that I wanted to really start it. At that time I was playing very different music from what we play now. My favorite band was Arctic Monkeys, so the first song I learned by myself with an electric guitar was “Dancing Shoes” by Arctic Monkeys and it felt amazing because I was able to do it. And only after that I finally found metal. Emmanuel Calderon: If we go back to 2010, we go back to basic stuff like Metallica, Megadeth, Lamb of God, Death, and we used to play covers of Sepultura and Exodus as well. So mainly we were influenced by thrash and death metal. Emmanuel: My first big metal concert was Metallica, in 2009, which was the first time they came to Costa Rica. This kind of opened my eyes, in the sense that I noticed there were so many people that listen to metal here. What’s the metal scene like in Costa Rica? Emmanuel: Right now, it’s pending, or stopped. No one knows what’s going on, the bands stopped being as supportive between each other as they were before, and definitely when it comes to organization and exposure, the media hasn’t paid attention lately and the scene is very difficult right now. Also, the investment for metal bands is very high, and the public is not being able to give that back, since people have stopped attending national concerts and that makes it harder, too. Emmanuel: Currently, bands like The Faceless, Cattle Decapitation, Gojira, Beyond Creation, Cynic, Akercocke, Between the Buried and Me. The rest of the music would be a lot more individual, so those are the bands I would mention among us. Emmanuel: Yes! We have two singles already out: “Transmute” and “Saturnian Mindscope Introspection,” which are Spotify and YouTube as well. And we have the album released now! We are also open for options in regards to labels, and if there’s a possibility to get one that’d be great!